The software accesses through an array a memory location that is outside the boundaries of that array. Often referred to as a "buffer," an array is a contiguously allocated set of objects , called elements. An array has a definite size, that is, a definite number of elements are allocated to it. The software should not use the array name to access anything outside the boundary of the allocated elements. The elements are all of the same data type and are accessed by integer offsets. If the software can utilize the array name (more generally, array handle) to access any memory other than the allocated objects, it falls into this class. The causes, attributes and consequences of the Buffer Overflow (BOF) class are depicted and explained below. Buffer Overflow (BOF) class - click on image for detailed view. Which end of the array is violated. Synonyms for boundary are side, bound or end. The terms before, under or lower may be used instead of below. The terms after, over or upper may be used instead of above. The term outside indicates that the boundary is unknown or it doesn't matter. What part of memory the array is allocated in. It may matter since violations in the stack may affect program execution flow, while violations in the heap typically only affect data values. Other compilers and operating system may have other locations that are significant. For instance, other locations are BSS (uninitialized data), Data (initialized) and Code (text). Magnitude - Small, Moderate, Far. How far outside the boundary the violation extends. Small means just barely outside, e.g. one to a few bytes, moderate means is from eight bytes to dozens and far is hundreds, thousands or more. Data Size - Little, Some, Huge. How much data is accessed beyond the boundary. As in magnitude, these distinctions are important in some cases. For instance, Heartbleed  might not have been a severe problem if it just exfiltrated a little data. The fact that it may exfiltrate a huge amount of data greatly increases the chance that very important information will be leaked. Whether the violating access was preceded by consecutive accesses of elements within the array (continuous) or the violation was just accessing outside of the array (discrete). Synonym for excursion is span. Typically string accesses or array copies handle a continuous set of array elements, while a vagrant array index only reads or writes one element. "A continuous overflow accesses consecutive elements within the buffer before overflowing past the bounds, whereas a discrete overflow jumps directly out of the buffer." accessing a directly without sequentially accessing previous array elements -- gives us discrete excursion to a out of the array. 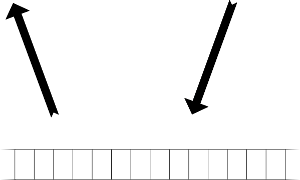 The step for sequential access of elements could be greater than one. That is, it may be a, a, a, which is continuous. Access before the beginning would be, e.g., a, a, a, a[-1]. (numberShadow is the number to be converted.) The array sequence is accessed "at random", that is, depending on the input. There may be an input that leads to accessing sequence, then sequence, then sequence[-1]. This does not constitute continuous excursion. It is discrete excursion. Any of the attributes may be "any," "don't care" or "unknown." For instance, strict bounds checking is equally effective regardless of the location, magnitude, data size or excursion of the violation. Keeping return addresses in a separate stack helps prevent problems occurring from write accesses when the array location is the stack. The array was allocated smaller than it should have been. This may occur because the programmer leaves out a factor, like the size of a header, uses the wrong variable, or forgets room for a null to terminate a string. More data is accessed than was anticipated. This may occur because the string is not NULL terminated or the amount of data is calculated differently than the size of the buffer (e.g. heartbleed). Exposition: When we examine code, we can say in some cases that the programmer allocated the array too small, such as in CVE-2015-0235 - Ghost. The code computes the size of a buffer needed, but leaves out one factor, which makes the buffer four bytes short. In other cases, too much data was accessed, such as in CVE-2014-0160 - Heartbleed. 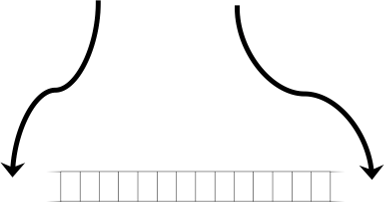 A string was stored in an array, but instead of computing the length of the string, the code used a length from the input, which was not checked against the string. This can cause the code to read far more from the buffer than was allocated. In both cases, the size of the data exceeds the size of the array. Just looking at the code, it may be difficult to determine which case it is - it needs semantic content. That's why the two are sub-causes of one cause. Data Exceeds Array may be caused by an Input [that is] Not Checked Properly [REF] or by an Incorrect Calculation [REF]. The specific cases of Data Exceeds Array are Array Too Small and Too Much Data. Too Much Data may be caused by No NULL Termination [REF]. Wrong Index [or] Pointer Out of Range may be caused by Incorrect Calculation, too, or by an Incorrect Conversion [REF]. The specific cases of Incorrect Calculation are Missing Factor, Incorrect Argument, Off By One, Integer Coercion, Integer Overflow Wrap-around and Integer Underflow. The graph of consequences shows what could happen due to the fault. The ACI cluster of consequences is the same in all classes where it appears. "Resource Exhaustion" refers to Memory and CPU. BOF may occur at the use of [ ] or the use of unary * operator with arrays in the C language. Sites also include the use of many string library functions, such as strcpy() or strcat(). CWEs related to BOF are CWE-118, CWE-119, CWE-120, CWE-121, CWE-122, CWE-123, CWE-124, CWE-125, CWE-126, CWE-127, CWE-129, CWE-680, CWE-786, CWE-787, CWE-788, CWE-823. The only related SFP cluster is SFP8 Faulty Buffer Access under Primary Cluster: Memory Access. The corresponding ST is the Buffer Overflow Semantic Template. ISO/IEC 9899:2011 programming languages - C, Committee Draft-April 12, 2011 N1570. The International Organization for Standardization and the International Electrotechnical Commission (ISO/IEC) Joint Technical Committee JTC 1, Information technology, Subcommittee SC 22, Programming languages, their environments and system software interfaces. Working Group WG 14 - C. Tech. Rep. 2011. Kendra Kratkiewicz. Evaluating Static Analysis Tools for Detecting Buffer Overflows in C Code. Master's thesis. Harvard University, Cambridge, MA. March 2005.